Earlier this month, a new phase of construction began on the Purple Line Extension, which means we’re one step closer to having a station at Wilshire/La Brea! Granted, it won’t be done until 2023, but hey—there’s no better time than the present to consider a public transit-based itinerary. Once it’s open, the Wilshire/LaBrea extension will bring with it plenty of opportunities for glorious, carless exploration: You’ll be able to eat and drink and not worry about driving home (or increased Uber fares). Why should you be so excited about spending time in Mid-Wilshire? Well, for one, the New York Times recently revealed that “District La Brea” is “one of the hippest drags in town,” despite having great places to eat, drink, and shop for, like, several decades. (Yes, the term “District La Brea” is a real thing. But also, hearing an Angeleno say it would be as laughable as hearing a San Franciscan call their city “San Fran.”) It may be seven years off, but for amusement’s sake, let’s pretend it was open now. If that were the case, here’s how you’d be able to spend a day—and a night—in DLB. Start with a delish lunch of tomato bisque and grilled cheese at La Brea Bakery Cafe. 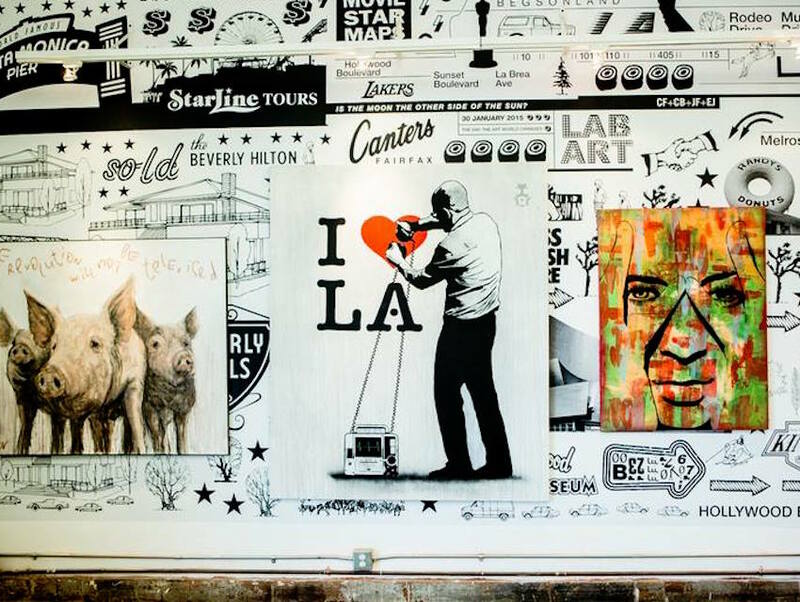 Wander up north a few blocks to LAB ART, the largest street art gallery in the U.S., then cross the street to check out the Merry Karnowski Gallery, once famous for being so popular that fans hopped fences to get in to opening receptions. A little further north, you’ll find wallspace (featured above), which shows contemporary and abstract pieces. After all that, head back down towards the stop to have dinner at Republique (probably not a bad idea to reserve a table in advance). Their market-inspired cocktails are some of the best in L.A., and currently include a White Boulevardier made with bourbon, vermouth, and Suze, as well as a grapefruit cocktail featuring lime, tequila, Pamplemousse, and vermouth. If Republique isn’t your speed, make a night of exploring what’s happening south of the new stop. Grab a late lunch at Danny Trejos’ newly-opened Trejo’s Tacos. Head back north to hit up happy hour at Rascal; keep drinking until you’ve worked up an appetite again, then swing by JINYA for some ramen before bouncing over to Little Bar (above), a Boston-themed dive with your favorite whiskey on the shelf and beers on tap. Cap the night off with margaritas (and more snacks) at Candela, which also offers $1 taco Wednesdays.